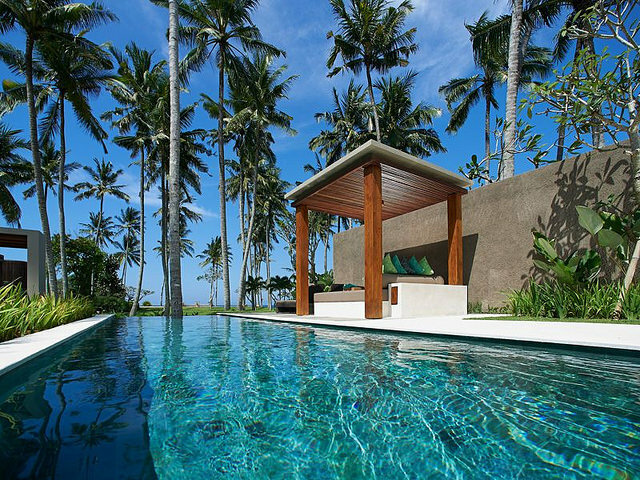 Dolphin coves, surf cottages, yoga retreats, snorkeling, thrice-daily buffets and chlorine-free pools. Sounds good, but too expensive? 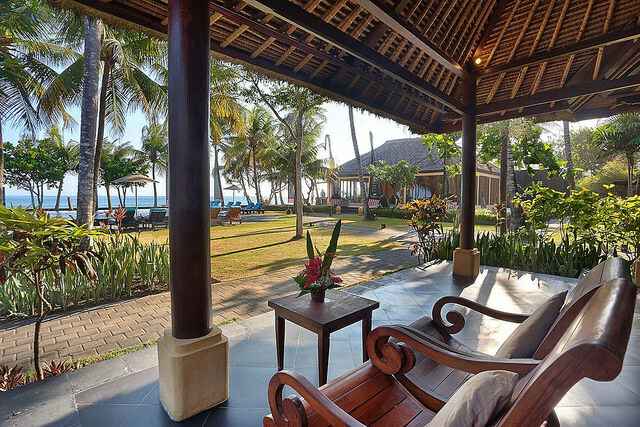 You don’t have to splurge to enjoy a luxurious holiday in Bali – we’ve found 12 amazing beachfront stays you can get for less than USD$80 a night. Here’s to waking up to the sight of fishermen setting off with their boats (or returning with their catch if you’re sleeping in) and falling asleep to the sound of the sea. 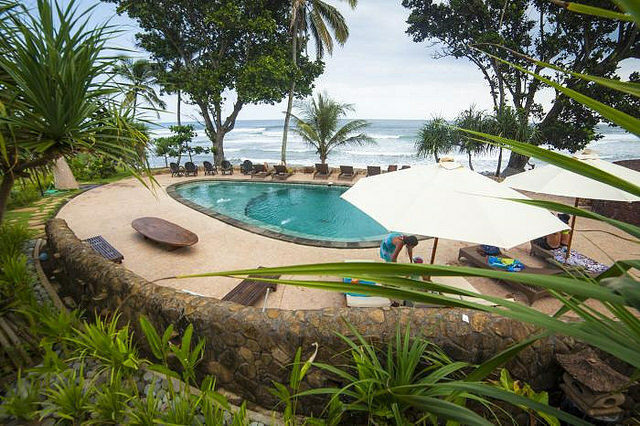 Villa Infinite Horizon is found along the east coast, surrounded by traditional Balinese rural life, villages, temples and breathtaking unspoiled nature of pristine black-sand beaches, volcanoes, rice paddies and tropical jungle. 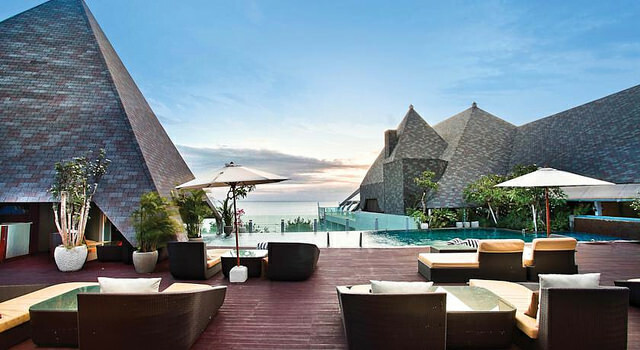 The Infinite Horizon features opulent villa suites, and all of them boast of jaw-dropping ocean views. 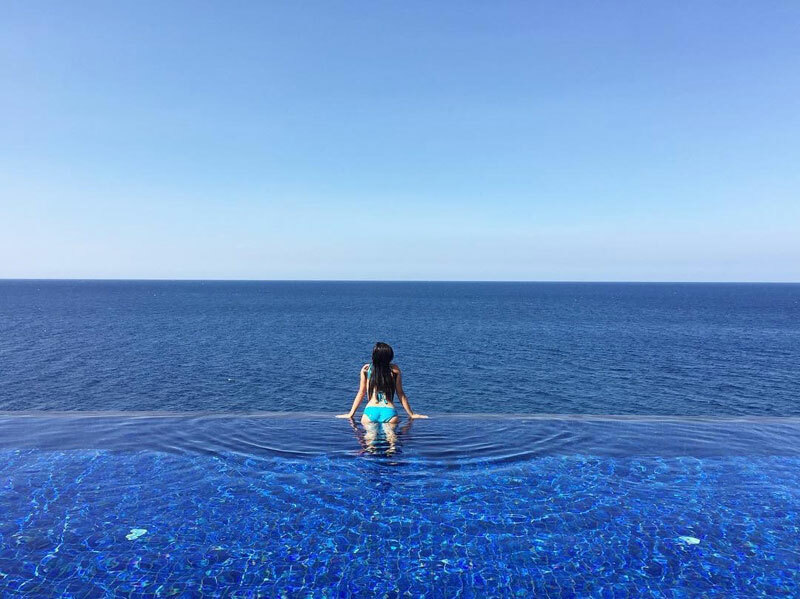 While swimming in the glorious infinity pool, you’ll appear to be floating into the sea, or even better, flying away in the clear blue sky. 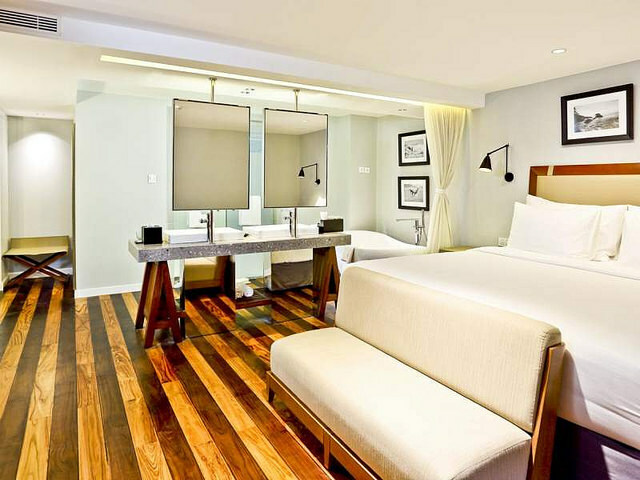 Staying here allows you to bathe in luxury while still being kind to your holiday budget. 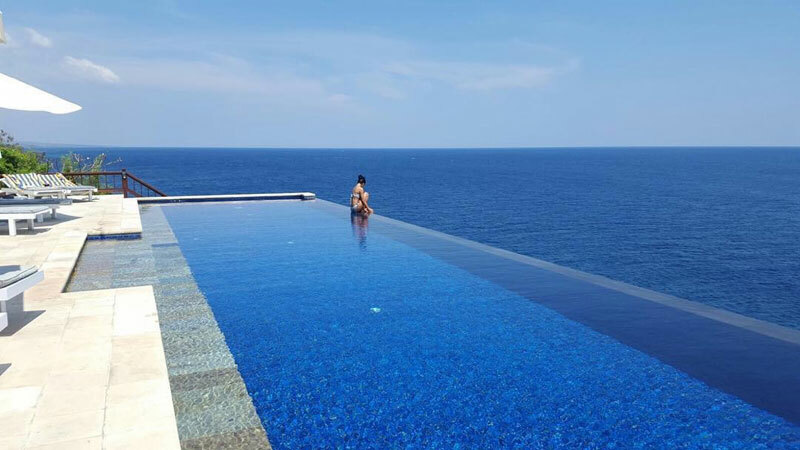 The lavish suites feature private terraces overlooking the infinity pool and the ocean. 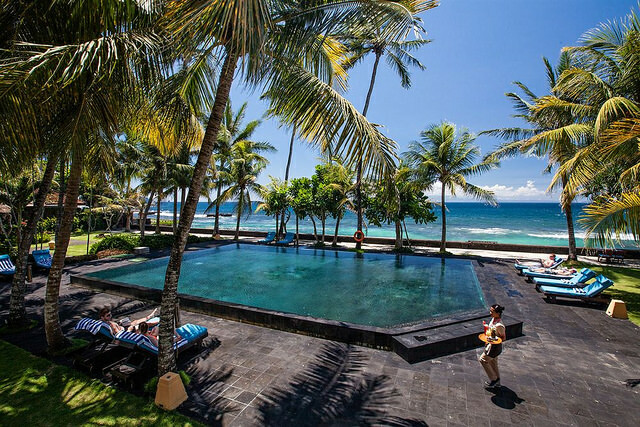 Swim in the infinity pool, enjoy on-site watersports and snorkel in Tulamben (10 minutes’ drive away) to see the rich colorful marine life and a sunken Japanese Shipwreck. 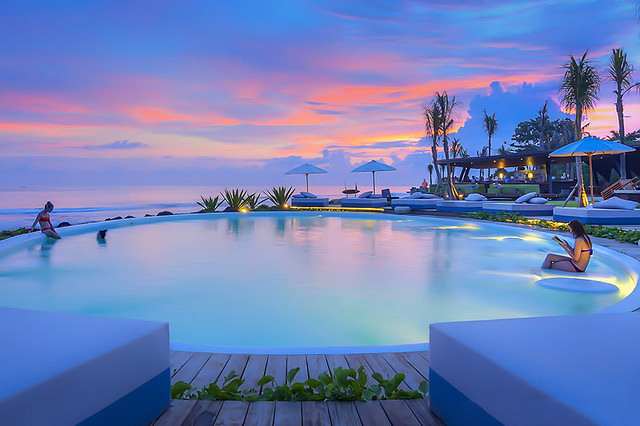 Nestled on the pristine shoreline of East Bali, Wyndham Tamansari Jivva Resort offers a rare slice of unspoiled Bali in a serene location that seems to be light years away from the hustle and bustle of Kuta. 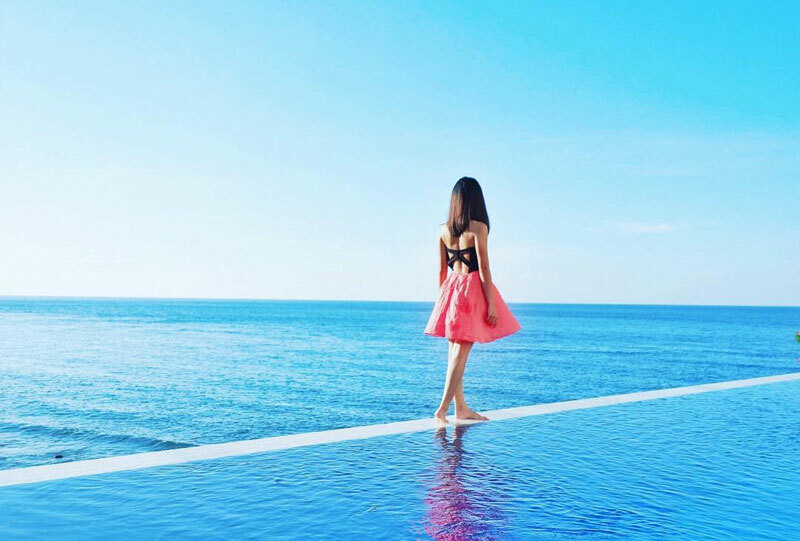 Besides boasting of an absolute beachfront location and tranquil Balinese vistas, the resort offers an indulgent taste of modern luxury with an endless blue pool and five-star amenities ranging from delicious dining options to divine spa facilities. Choosing our favourite spot on the premises is a no brainer. 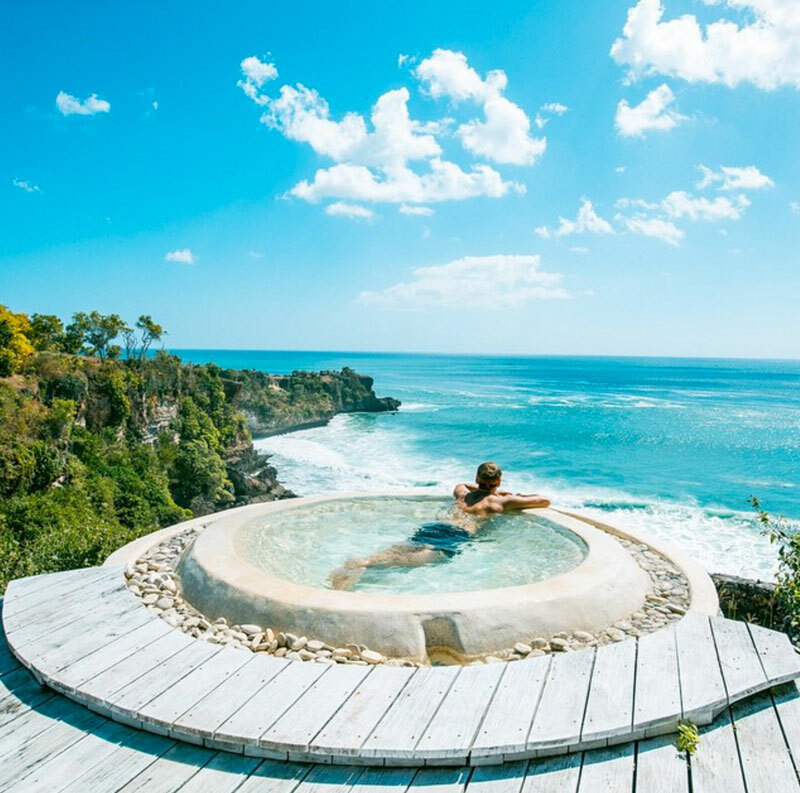 If you ask us, nothing really beats a decadent soak in your very own jacuzzi, especially when said jacuzzi happens to be sitting on your very own balcony, which comes complete with killer views of the Indian Ocean. 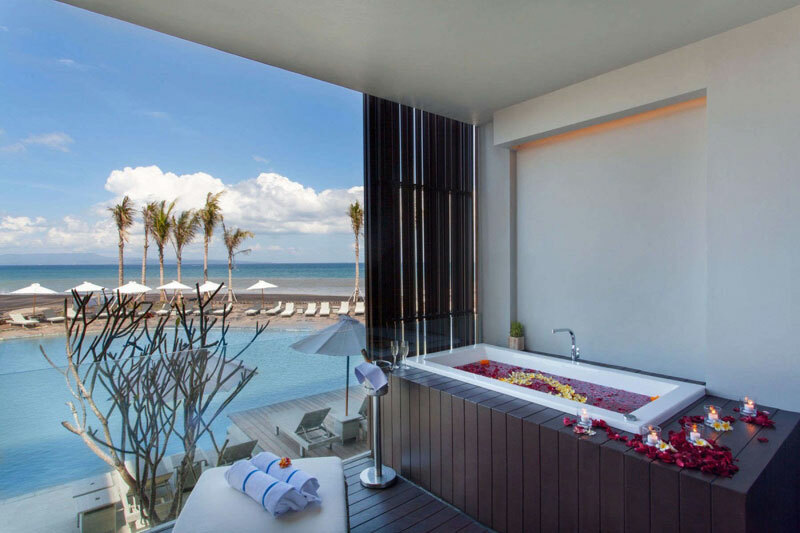 In addition to the sumptuous views, Wyndham Tamansari Jivva Resort’s Jacuzzi Ocean View Suite offers a sleek modern decor and the perfect backdrop for those envy-inducing holiday snaps. 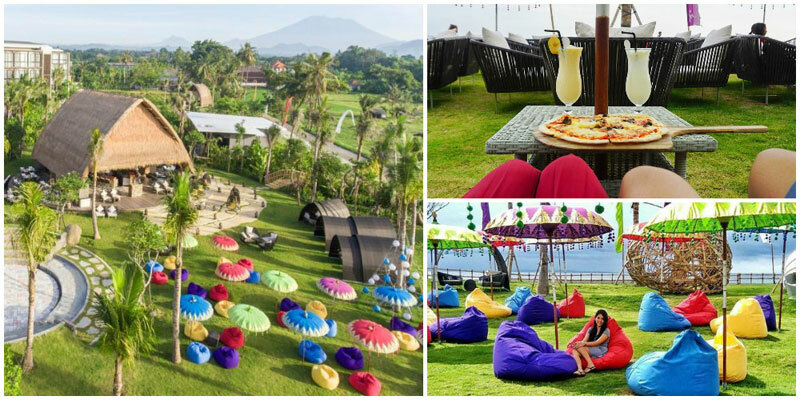 After a relaxing soak out on the balcony, head downstairs and grab a rainbow-hued beanbag chair out on the lawn and witness a majestic Bali sunset with a cold drink in hand. 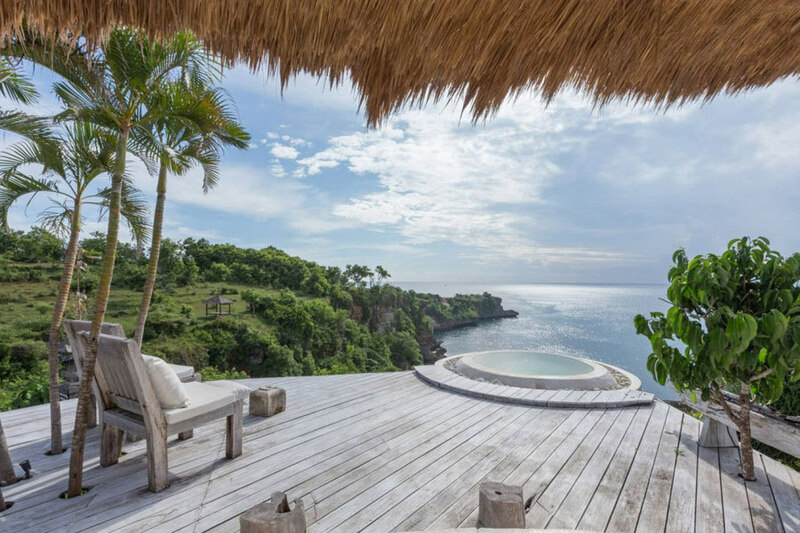 Rumah Luwih is a vision in white, a modern-day mansion perched right on the beach. 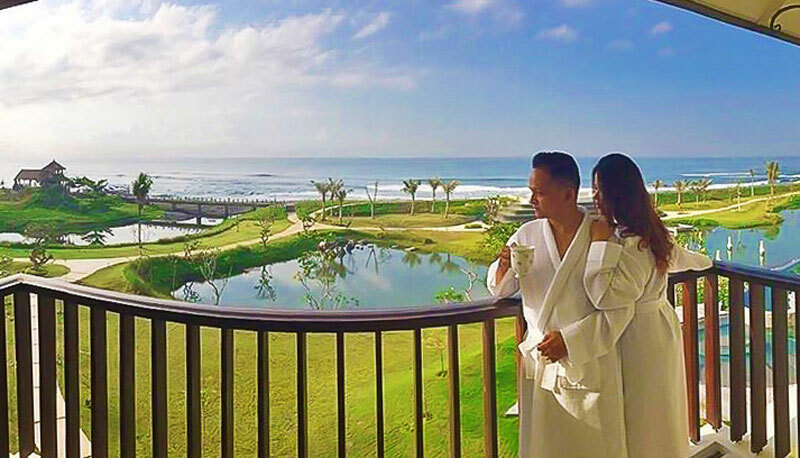 From the lavish comfort of the Arnawakanta Ocean View Suite, you can enjoy sweeping views of the resort’s landscaped gardens that reaches all the way to the Bali Sea. The room’s generous windows reveal shimmering shades of blue, while the private balcony allows you to enjoy those vistas unhindered. In addition to the breathtaking views, the decor of the room is utterly charming with romantic influences, evoking the feel of a luxurious estate untouched by the hectic pace of the modern world. 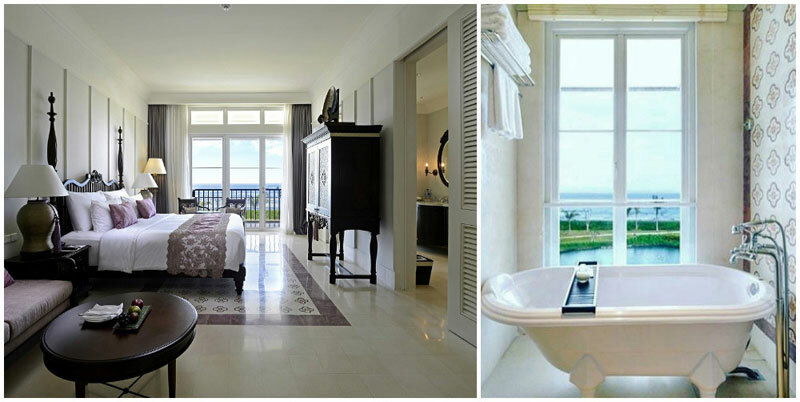 You can also enjoy views of the ocean while indulging in a soak in the room’s glamorous bathtub! 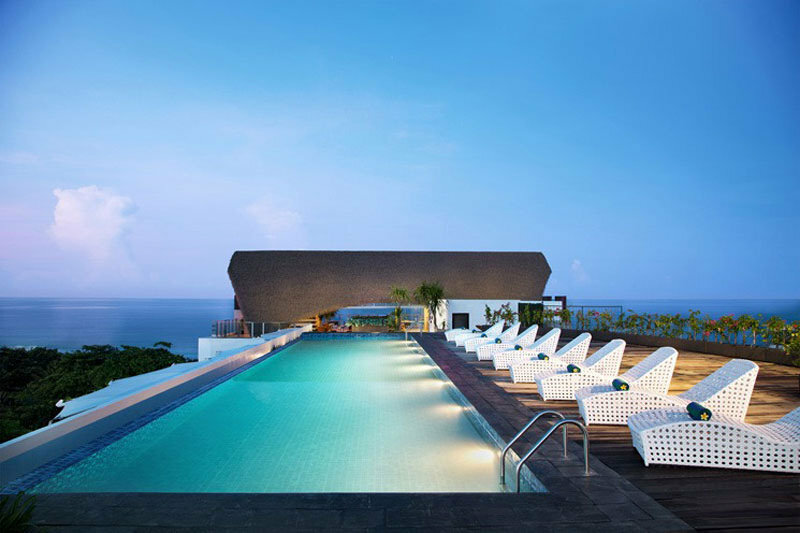 The resort also features a massive swimming pool, which opens out to five-star views overlooking the beach. 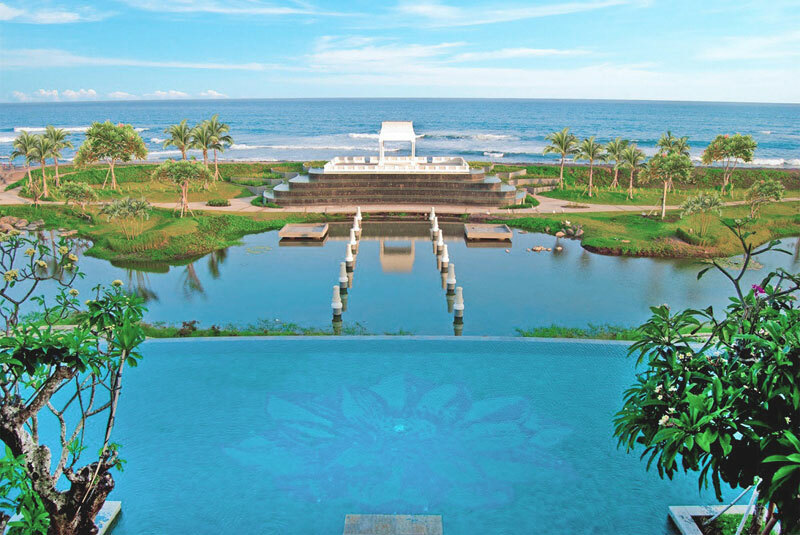 If you are there with your romantic partner, you’ll love to take a walk by the tranquil pond, which creates a scenic backdrop for the seaside chapel, ideal for hosting your dream Bali wedding. 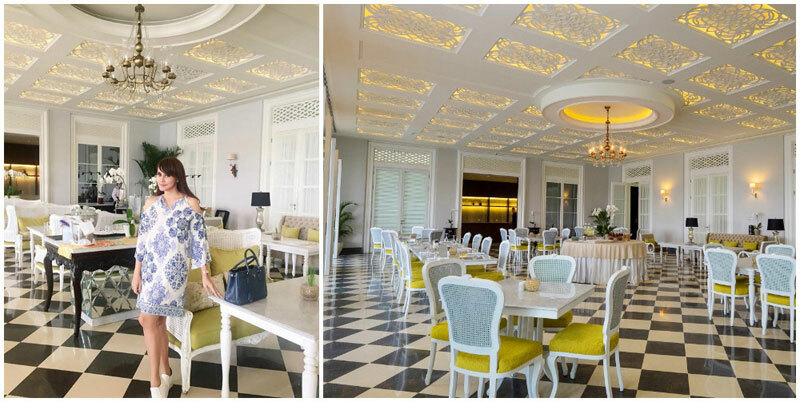 In keeping with Rumah Luwih romantic design, the elegant dining room is adorned with chandeliers and ornate wooden carvings, creating a truly unique setting for enjoying breakfast, lunch or dinner (they also do Sunday brunch!). 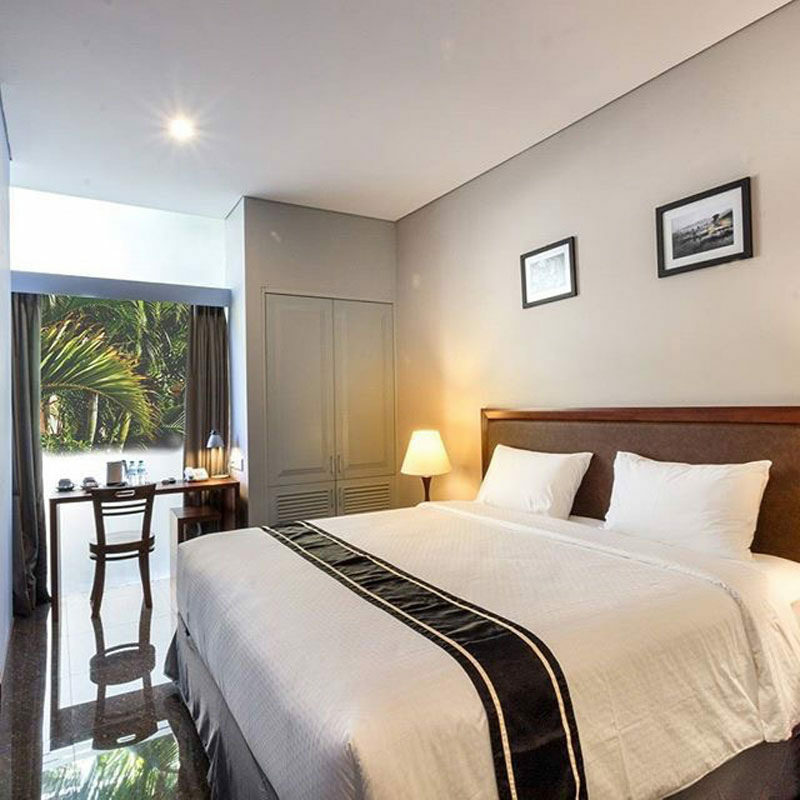 If your main goal in Bali is to have a great snorkeling experience, and watch the glistening ocean waters from the comfort of your room, then the Bed & Breakfast & Bistro Aquaterrace is the place for you. 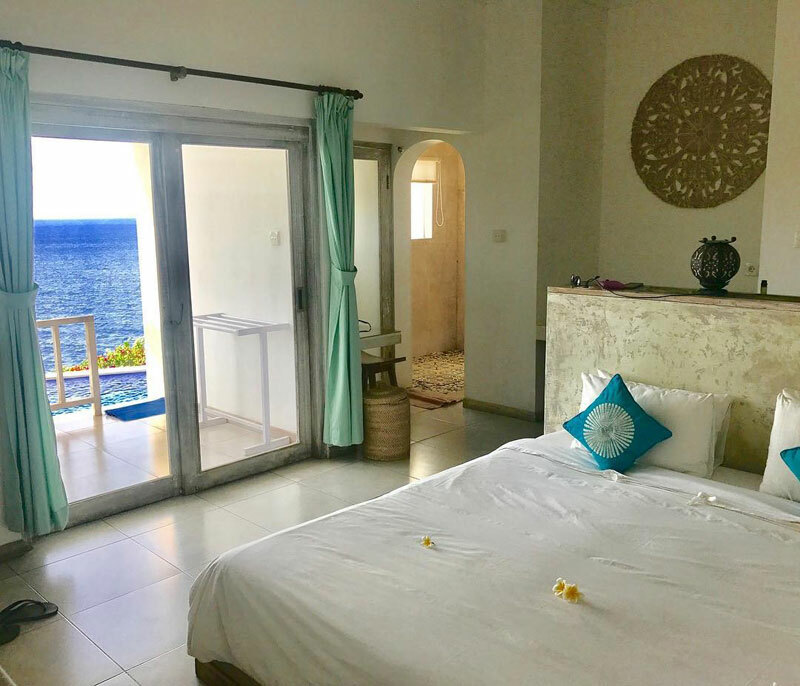 Located in Amed, the villa is renowned for its beautiful coral reefs, and you can actually get to the best snorkeling location (in the village of Banyuning) in just 15 minutes! If water activities are not your thing, this unique place will still keep you occupied with its unique charm. 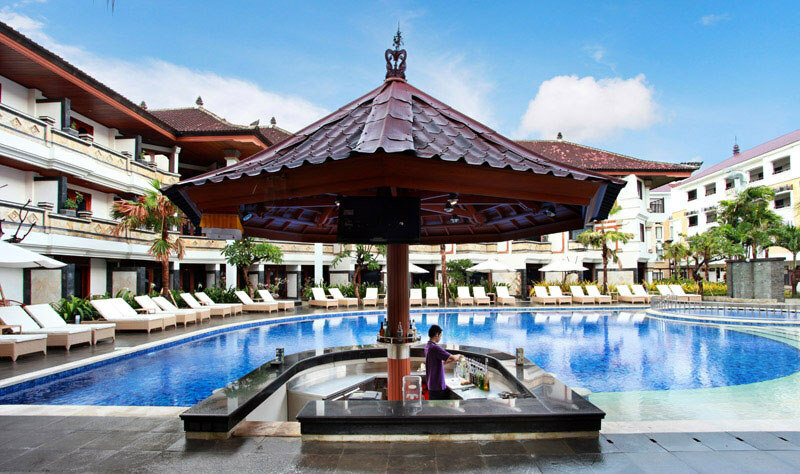 You can relax in the spa, on a sunbed beside the pool, or try out the special Japanese-Balinese fusion cuisine from the kitchen. 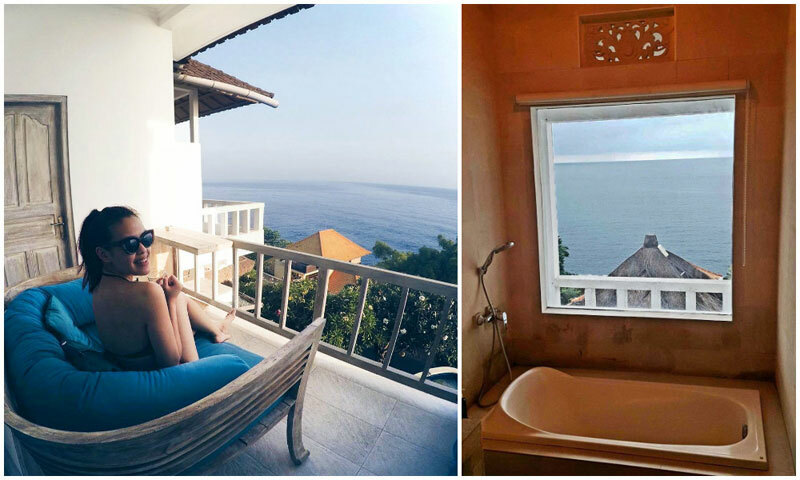 Even the bathroom window has a great view of the sea. What else can you possibly ask for? 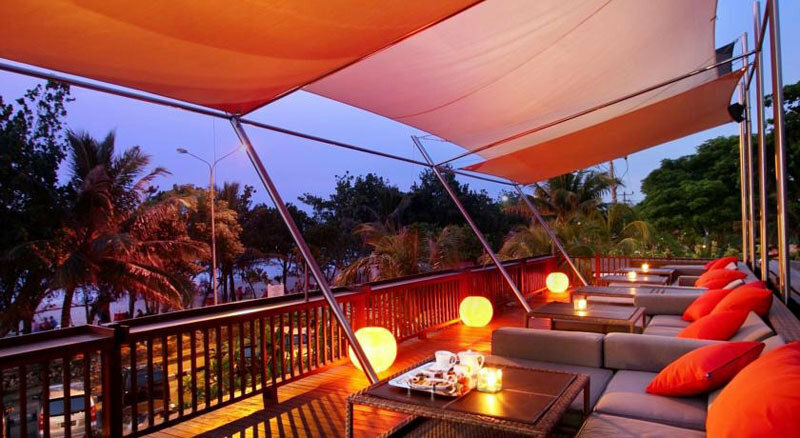 Who says that a hotel directly facing the beach has to be expensive? 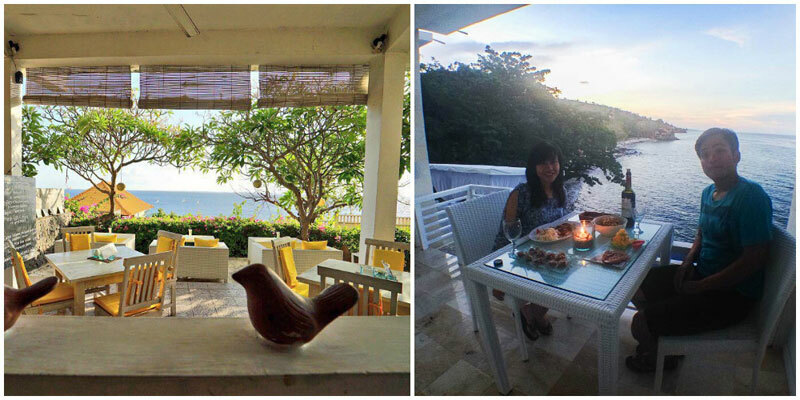 Kutabex not only gives you direct access to the beach, but also comes along with a range of other conveniences. 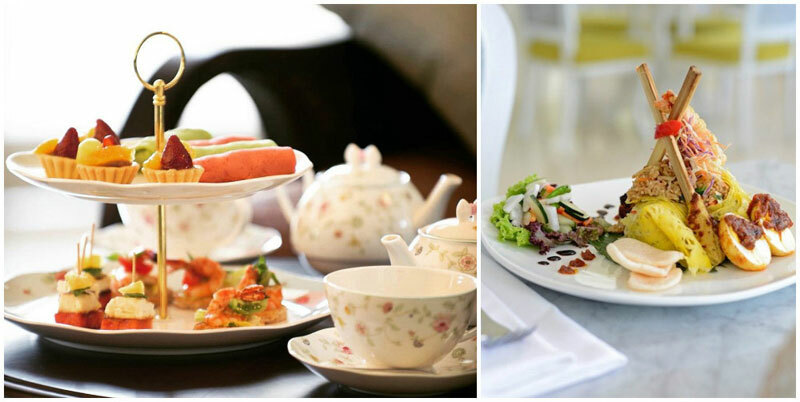 For one, it’s close to the shopping center, which makes it infinitely easier to get to one of the many restaurants for a dose of good food. 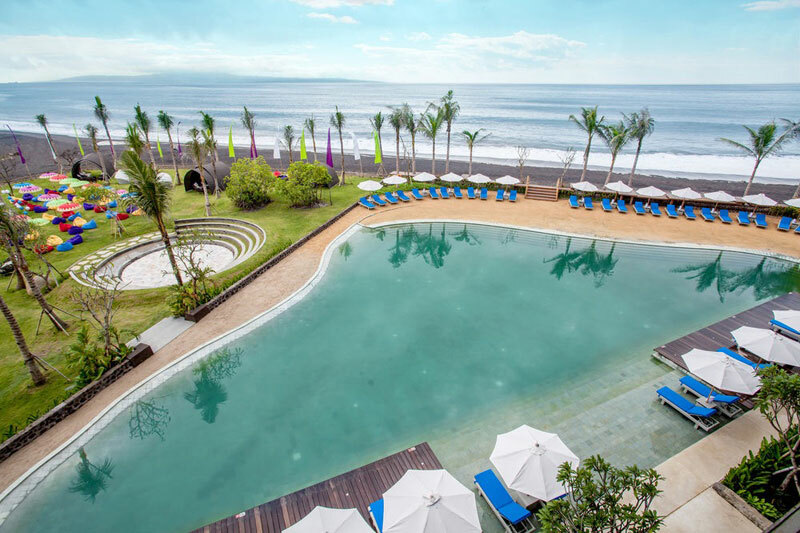 In addition, Kutabex is situated right by Kuta Beach, and isn’t far from Legian Beach, as well as the gorgeous Geger beach that’s less than 2km away! Heard of Poppies? The small street in Kuta that’s famous for its yummy eats and shopping treats? 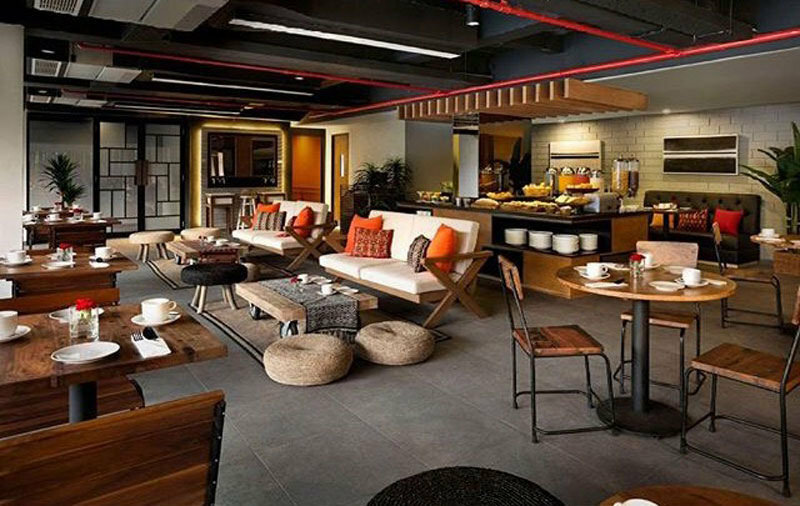 Easily accessed due to its close proximity to Kutabex, you’ll get to enjoy shopping and food here – while taking some choice Instagram shots with the attractive displays at Poppies. 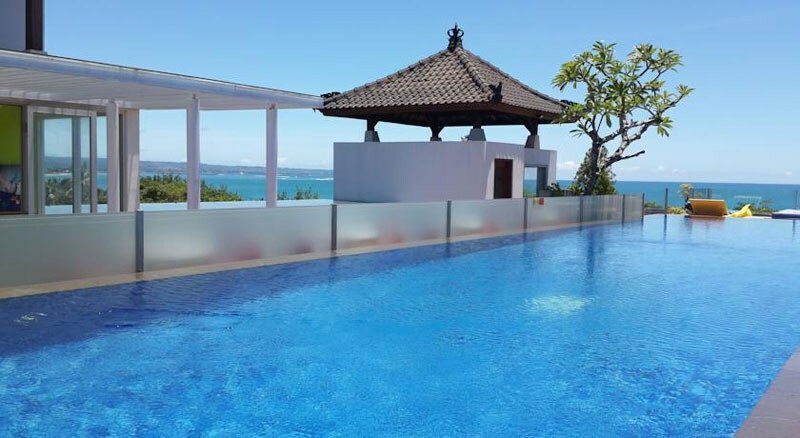 While Kutabex’s location is great for those who love beaches, eating, and shopping – those looking for a convenient place to stay while on a surfing holiday, will find Kutabex more than suitable too. 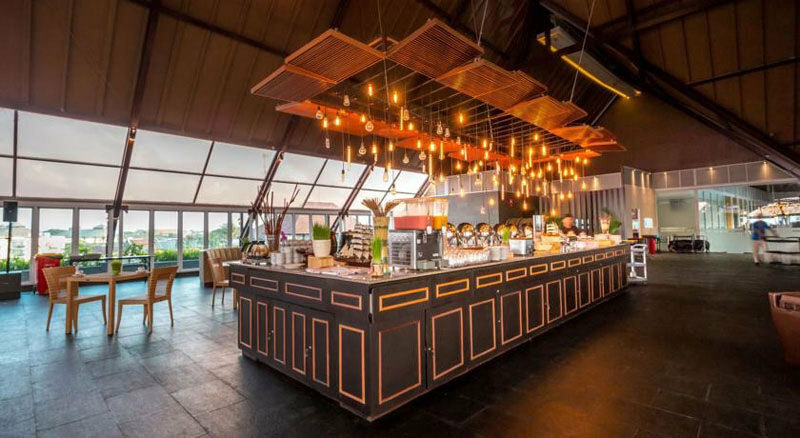 This boutique hotel will put you in a holiday mood right away, with an architectural style that reflects everything you came here to do: surf, yacht and explore. Even if you are not outdoorsy, there’s still plenty for you to do. The shopping district just seven minutes away, where you can get all your souvenirs. 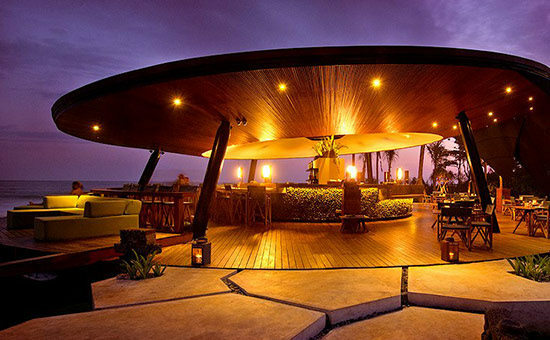 Or you can party the night away—some of the best clubbing Bali has to offer is only a short walk away. Try the Pyramid Club which has neon stilt walkers, live rock bands and dancers. 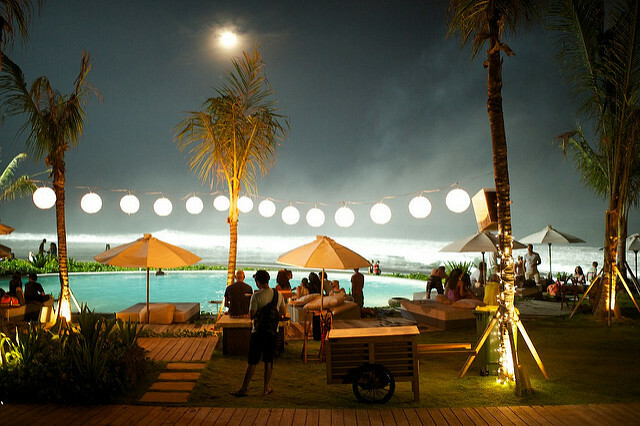 And at VH Bali, FHM models moonlight as DJs and molecular cocktails are served. 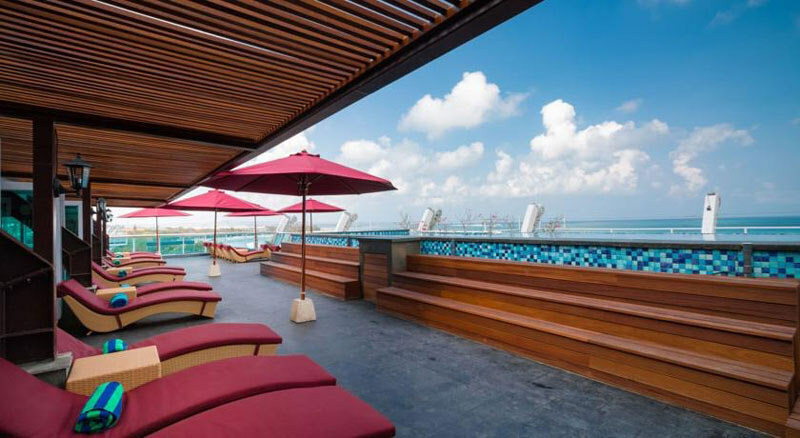 But if you want a bit of quiet and less walking, you can simply choose to cap the night with a drink at the rooftop bar, soak in the infinity pool and gaze at the Kuta beach. And another bonus – the hotel is also fully accessible to the disabled – very convenient indeed! 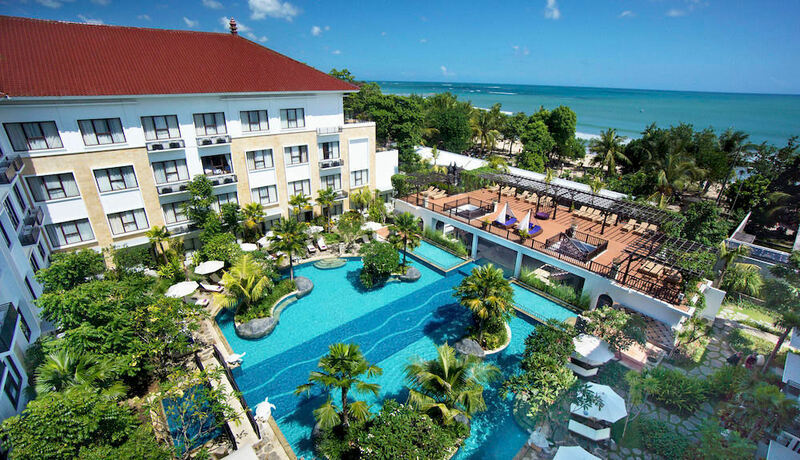 If you’d like to stick with the air-conditioning, 32-inch TV and a lovely buffet breakfast then Grand Inna Kuta is the place to be. 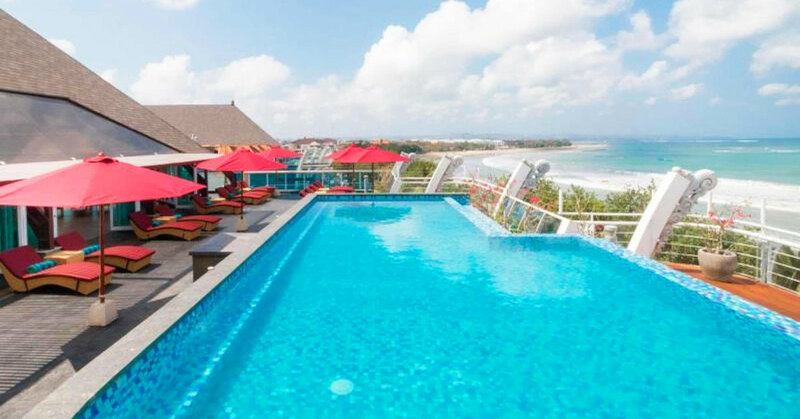 The luxury doesn’t stop here – the famous Kuta Beach is just a two-minute walk from the resort. 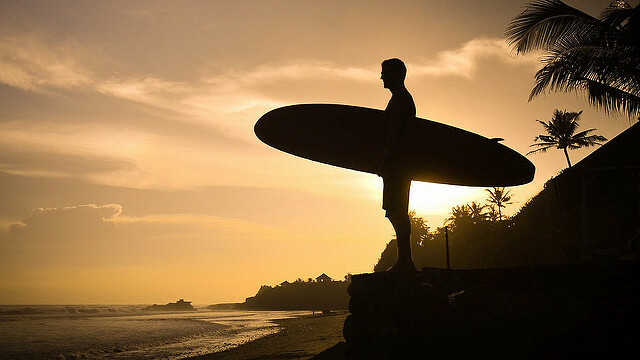 Simply pick up your board, or take your pick at one of the rental shops nearby and head to one of the hottest surf spots in town. 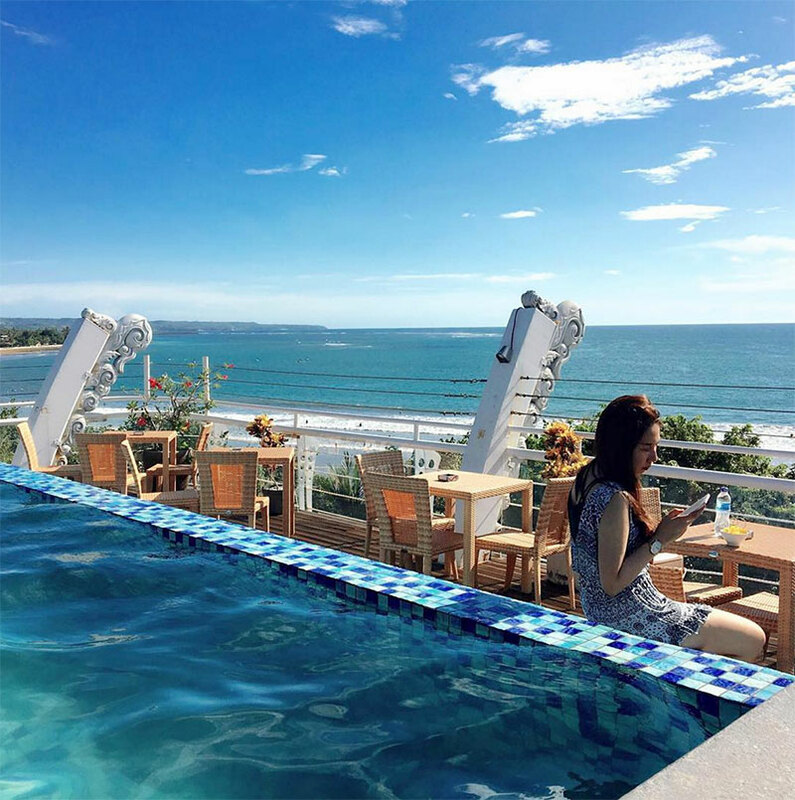 This 4-star hotel is situated just 3 miles away from the airport, and you’ll still be in the midst of all the happenings in Kuta. 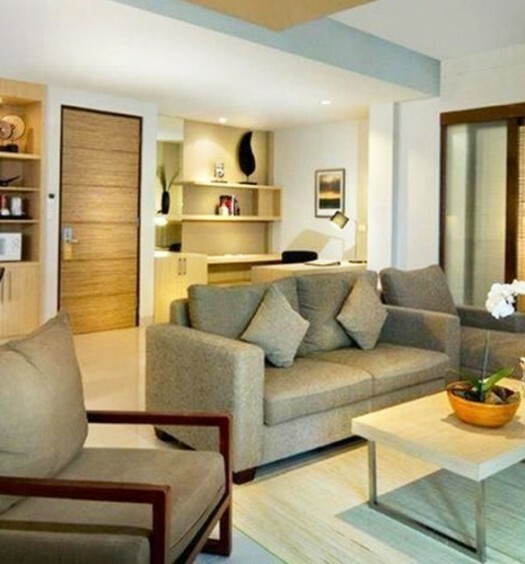 Not only is it one of the most affordable surf villas available – Grand Inna Kuta also gives you convenient access to everything you might possibly need. 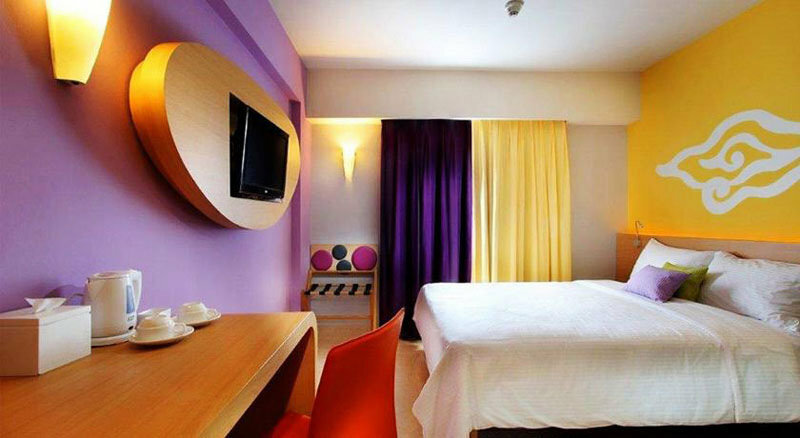 The great nightlife scene for those who like to stay up late, art markets for the creative, and of course, shopping. 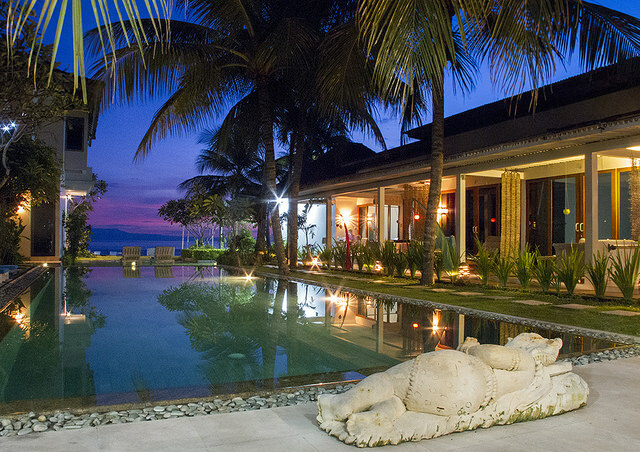 Nirwana Resort & Spa is steeped in quiet ambience, being located off the main road and away from the town of Candidasa. 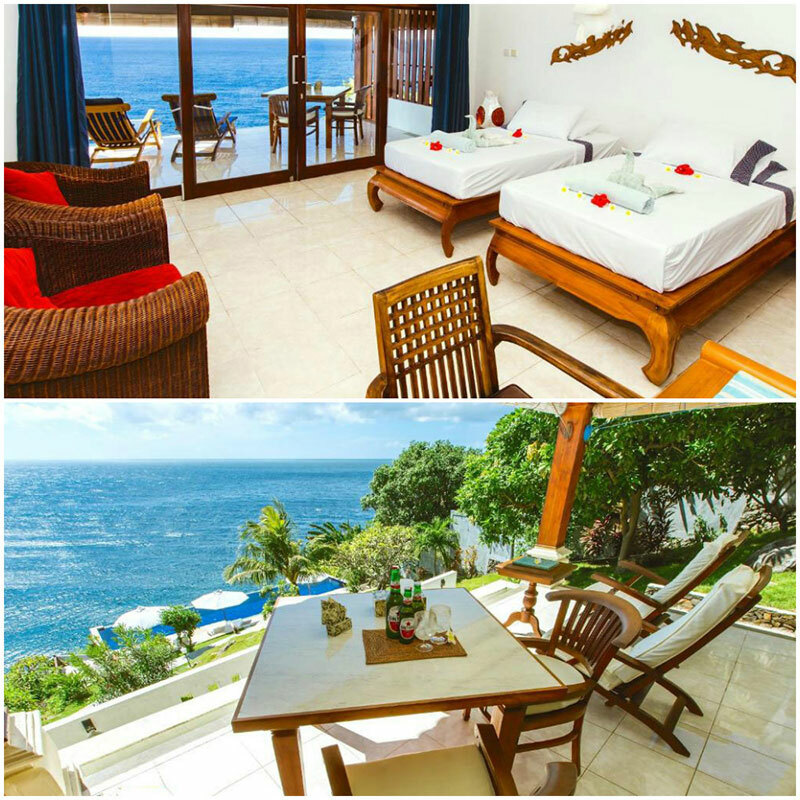 Such seclusion, combined with breathtaking ocean and mountain views of the Candidasa Regency, will put you in the right mood for rest and relaxation. 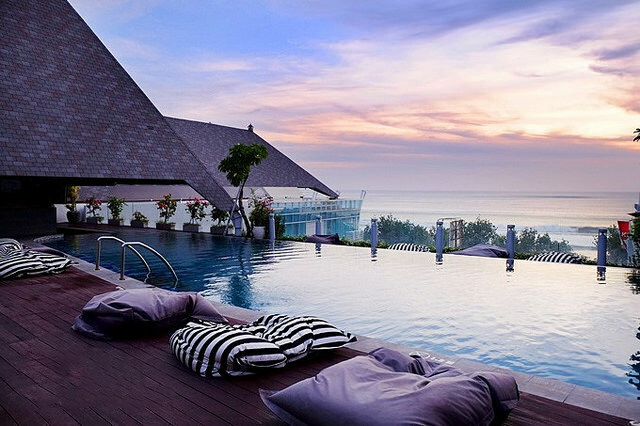 Enjoy a romantic moment with your loved one in the pool, and get adventurous with the easy access to the ocean. You can snorkel, fish, dive and explore nearby islands by boat. 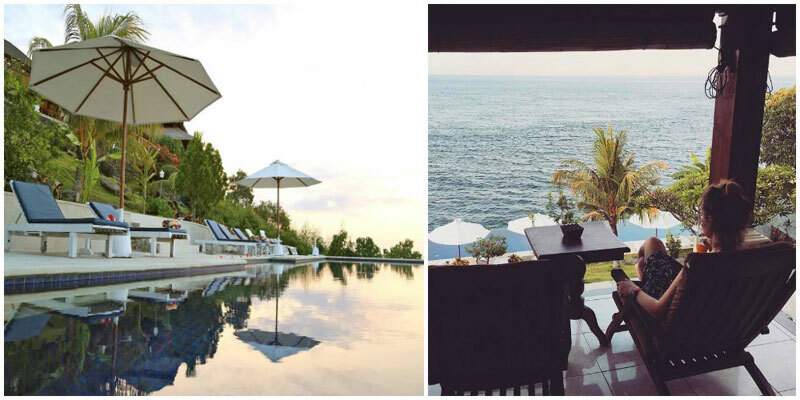 Where better for a quiet couple escape, on budget? 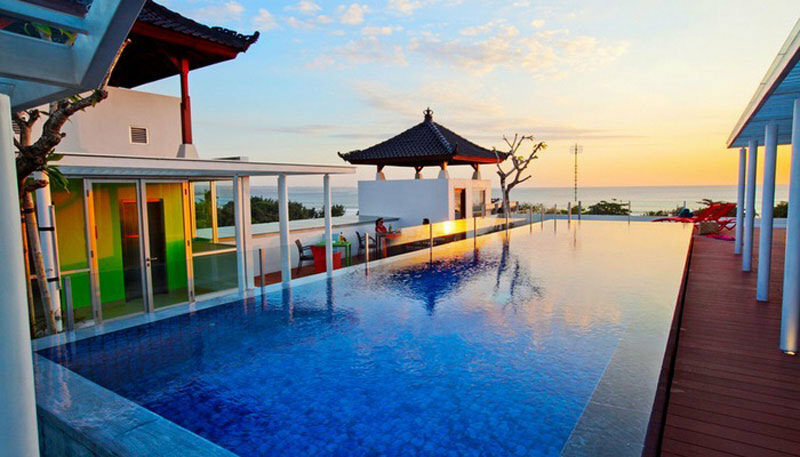 Located in the seaside village of Candi Dasa, Aquaria Bali feels distinctly authentic—local fishermen ply their trade, and an hour’s drive away in Karangasem, you can explore villages, water palaces, temples and diving sites rich with coral and sea life. You are free to snorkel, fish (and cook it yourself over an open flame on the beach), go windsurfing, parasailing, tour the temples, volcanos and paddy fields, and of course, dive. 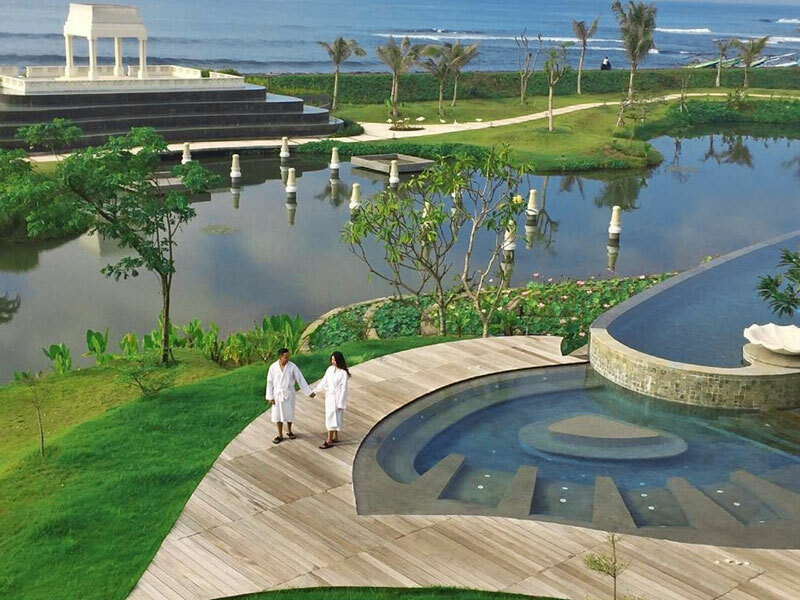 Don’t forget to enjoy a massage (how can you not while in Bali? 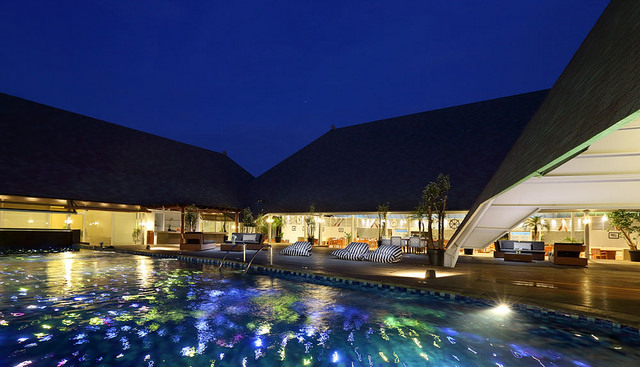 ), sip freshly squeezed juices and swim in the chlorine-free ionised stone pool. 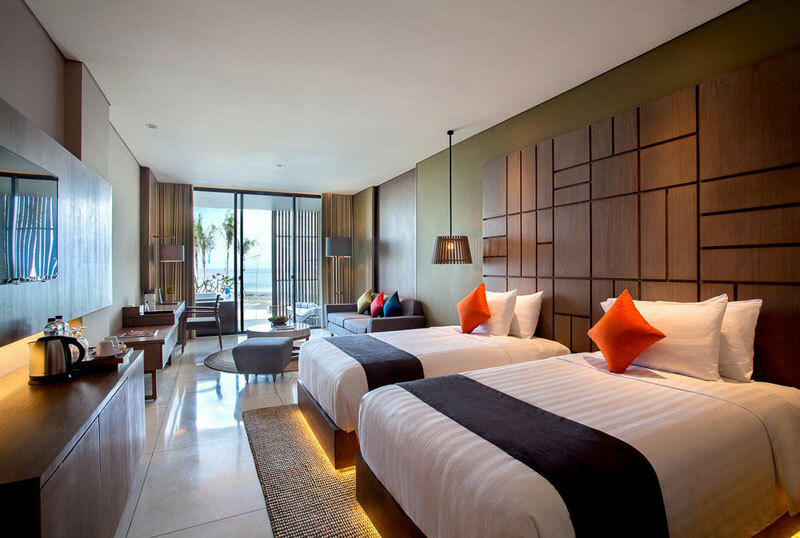 Aquaria Bali maintains the intimate atmosphere of its 12 villas by hosting a maximum of 24 guests at any time, so do book ahead! 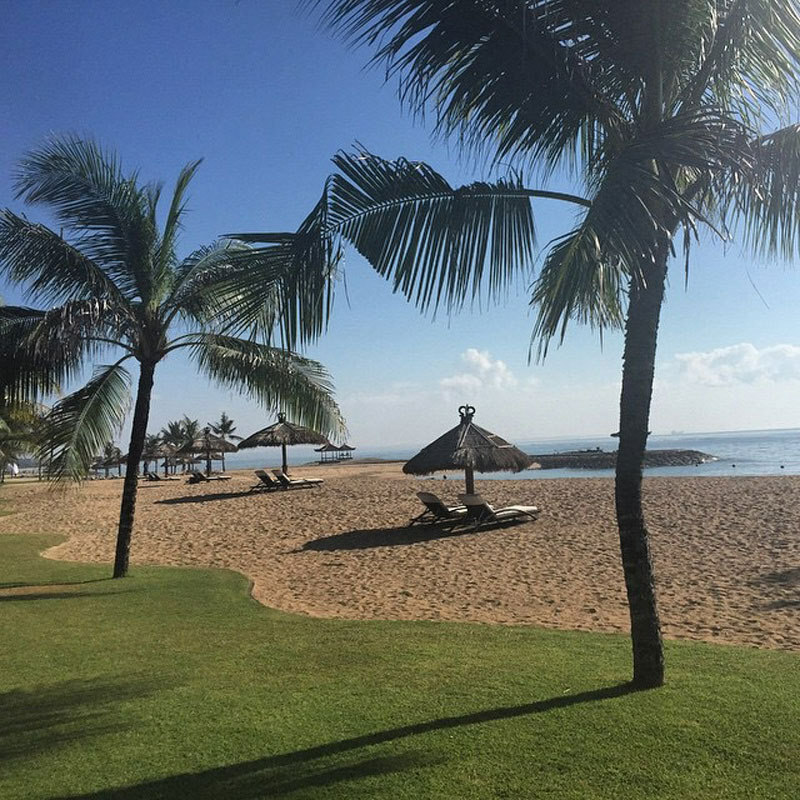 Apart from the Kuta or Nusa Dua areas, Benoa surprisingly also provides great hotels with beach access. 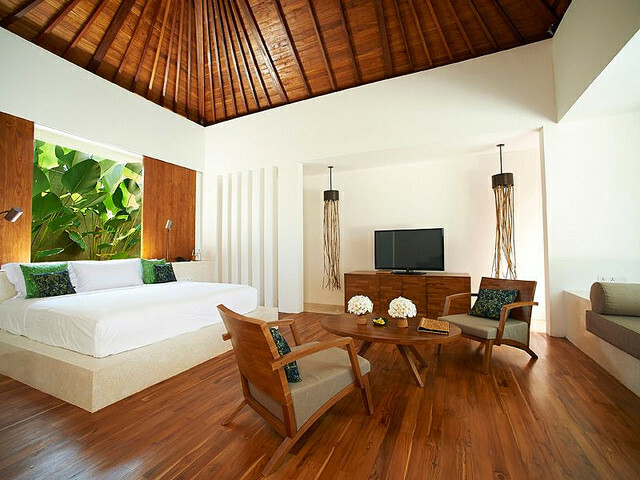 More notably, The Benoa Beach Front Villas & Spa with its spacious rooms complete with a mini bar and more facilities. 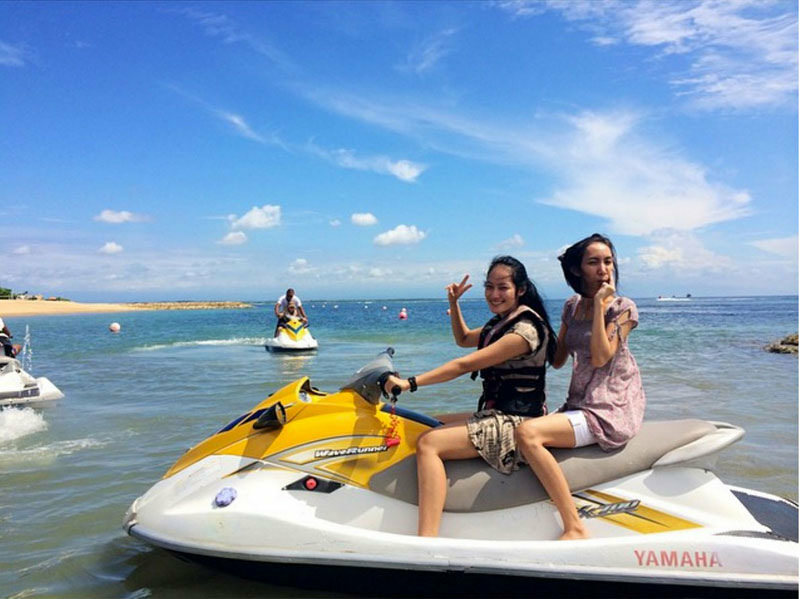 Ideal for those who love indulging in days of watersport activities in Bali – such as banana boat rides, jet skis, parasailing and more – The Benoa allows you to access these watersport activities easily. 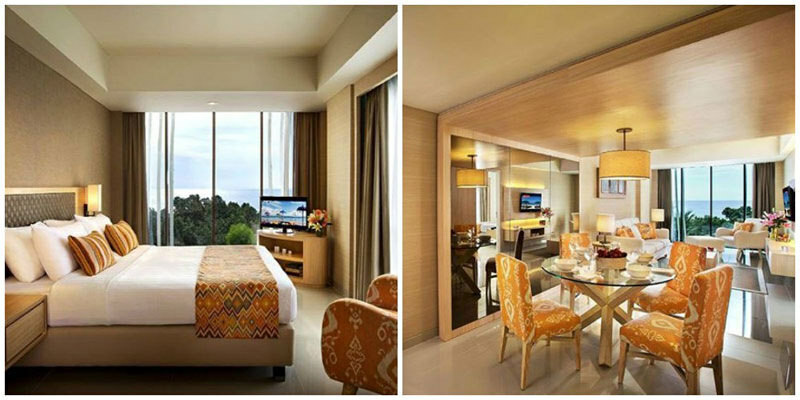 If you’re an avid golfer, you might be happy to know that the hotel is just a 5-minute drive from Nusa Dua Golf Resort! 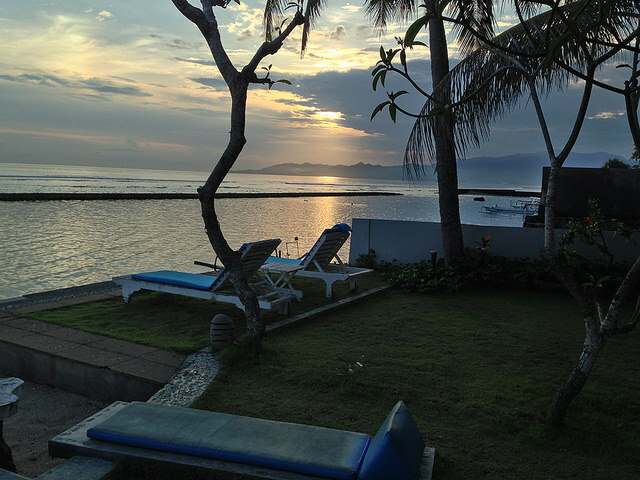 After physically demanding days of watersports spent out in the ocean or on the beach – enjoy massage services at The Benoa, and at very affordable prices too! 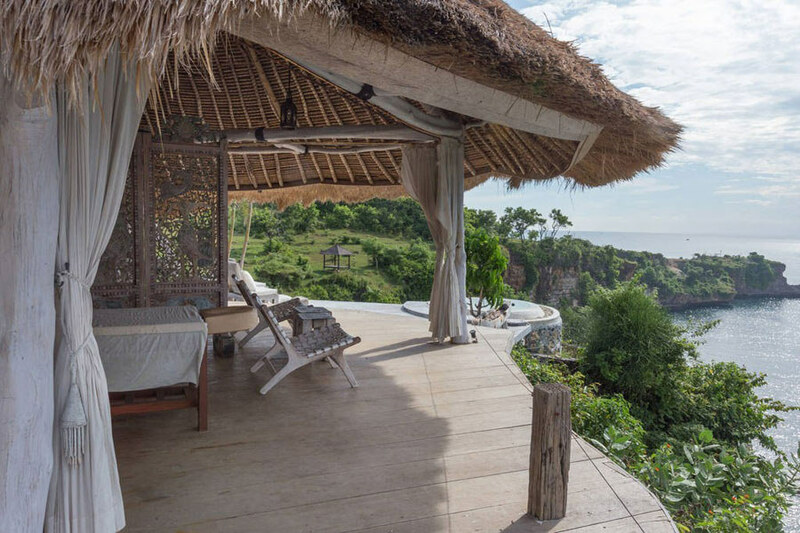 Pondok Pitaya in the village of Balian sits on Bali’s west coast, tucked up against a cliff wall. 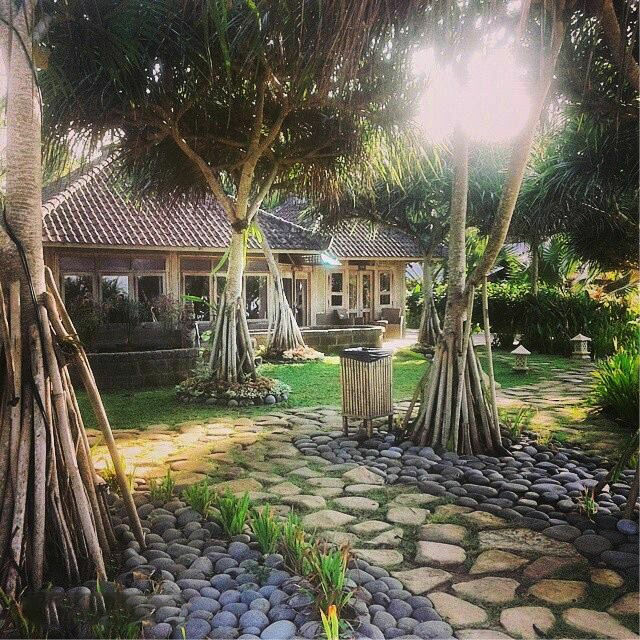 The first thing about Pondok Pitaya you can admire is its architecture. 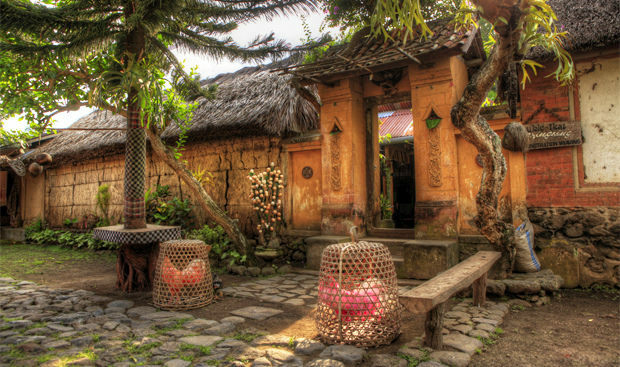 Each house is a traditional wooden Joglo house dating from 1930, imported from Java. 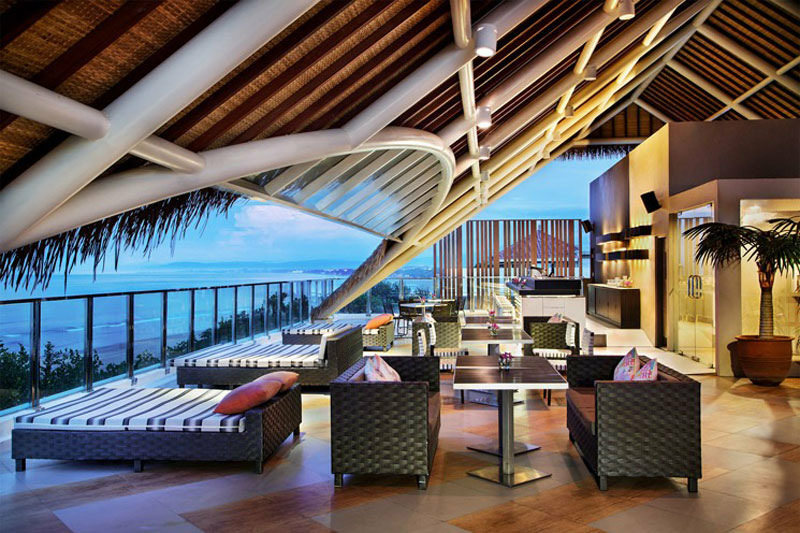 But of course, its amenities are very much as modern as any other luxury resort. 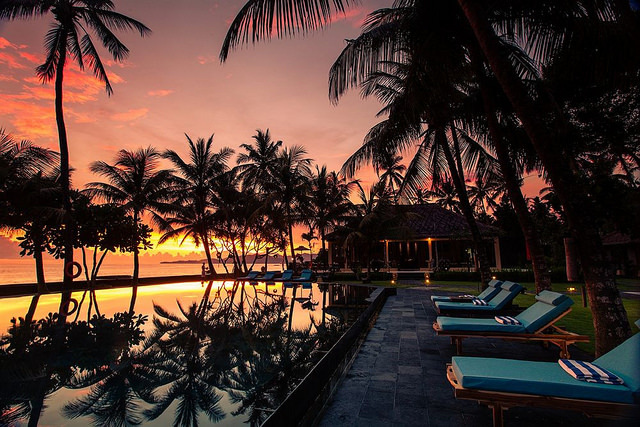 Between the beach that offers up quality surfing, the resort which offers yoga classes, spa by the beach and the clear night skies that are an astronomer’s dream, it’s safe to say this is an offer you cannot refuse. If you want to enjoy a bit of local colour, you can travel to the nearby town of Negara and watch buffalo races – held every second and fourth Sunday of the month from July to November. 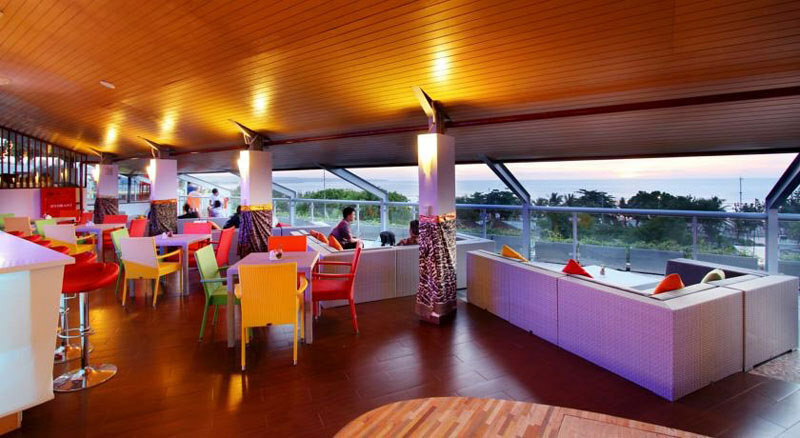 And don’t forget to mingle with the international surfers and locals at the resort restaurant – it’s the best place to make some new friends! 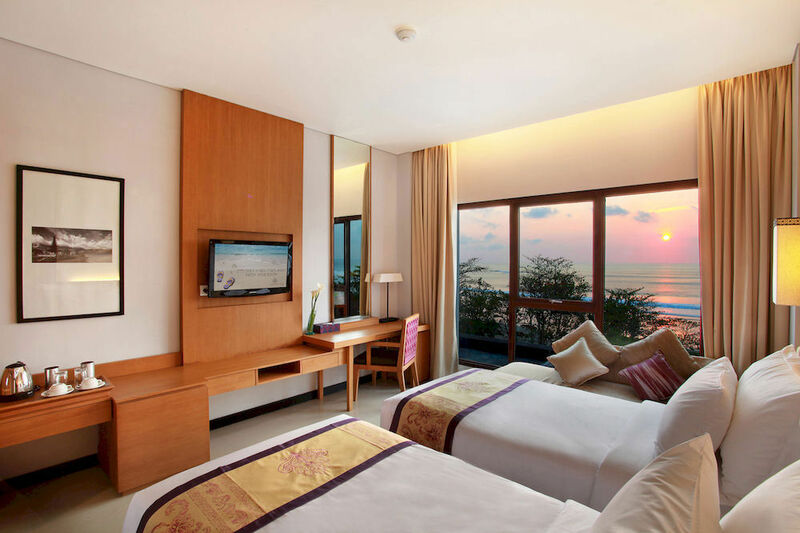 Whether you want to sunbathe, surf, or look out for sunsets, Kuta Seaview ticks off all the right boxes, and more. 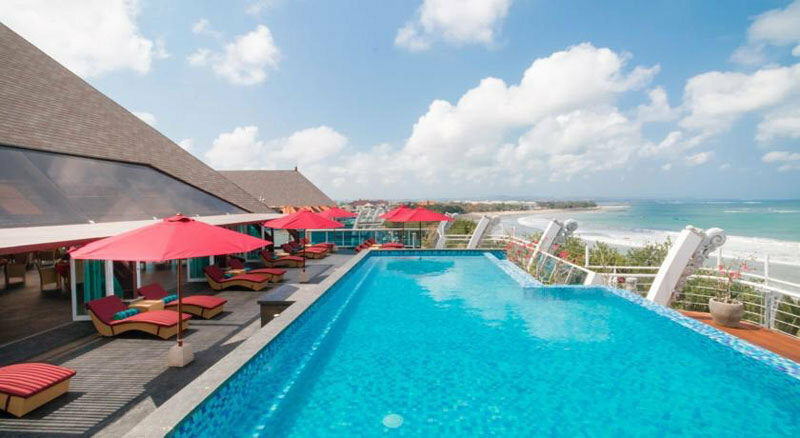 We most especially enjoy how its location allows holiday goers like us to easily access iconic Kuta places like Beachwalk Shopping Mall, Hard Rock Café, Poppies Lane, and Kuta Square. 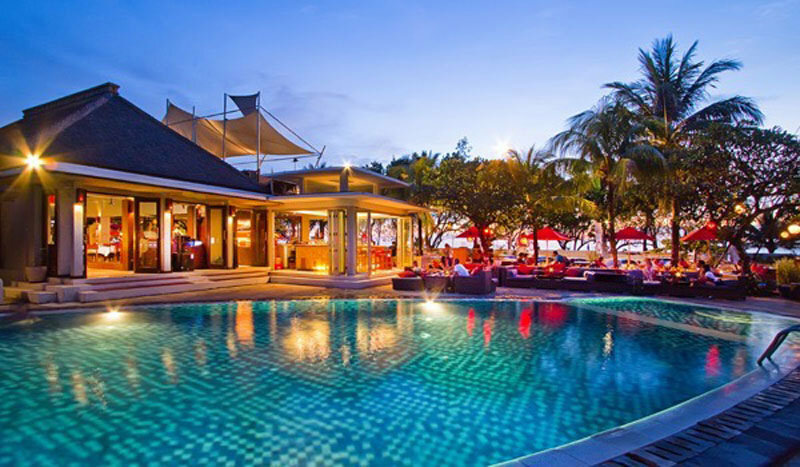 For those of you who enjoy bar hopping, Kuta Seaview is located right in the heart of things – you’ll be able to explore the nightlife while hopping from one bar to another. 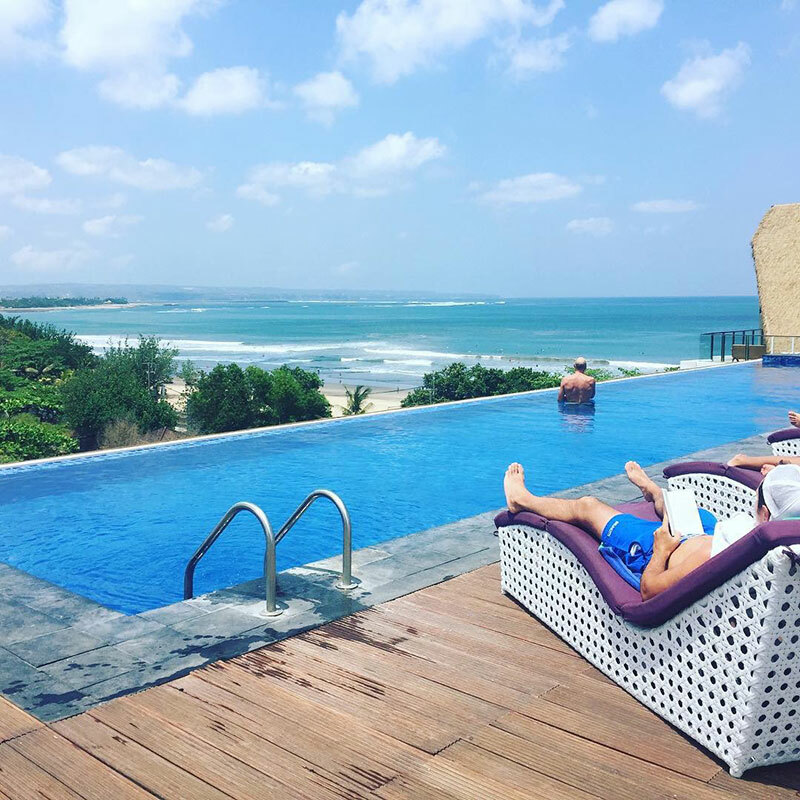 During the day however, once you’ve managed to leave your room with the gorgeous seaview, head out and enjoy the big and beautiful swimming pool. 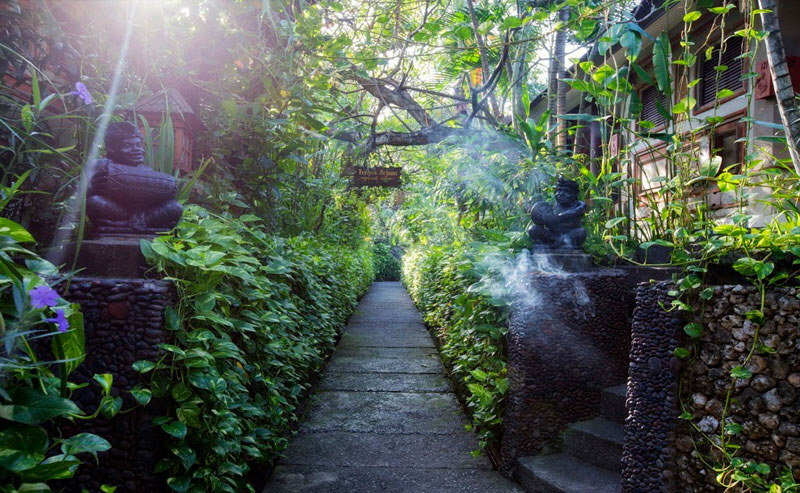 There’s even a library for those who’re looking for something quieter during the day, and traditional Balinese massages available for those feeling a little fatigued! 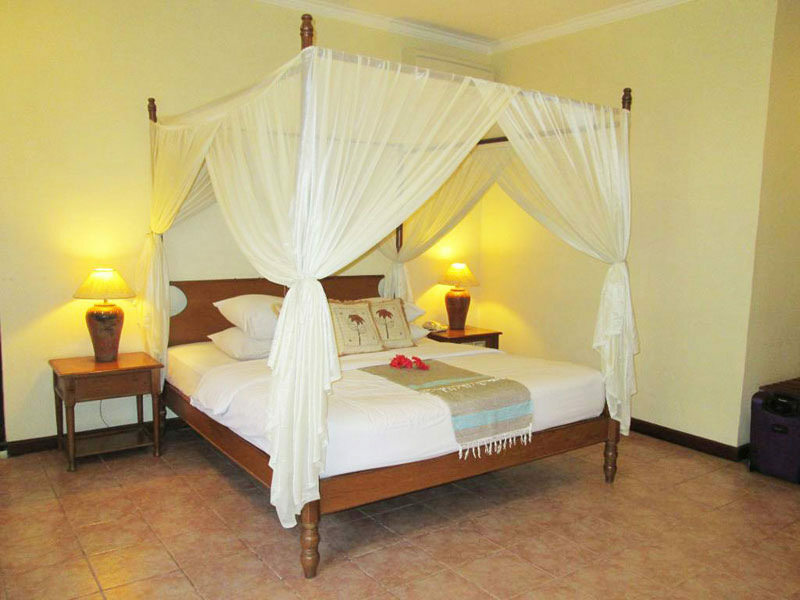 This tiny bungalow in South Kuta is a great choice for the environmentally-friendly traveller – it’s located within the La Joya Biu-Biu resort complex, an eco-friendly establishment. 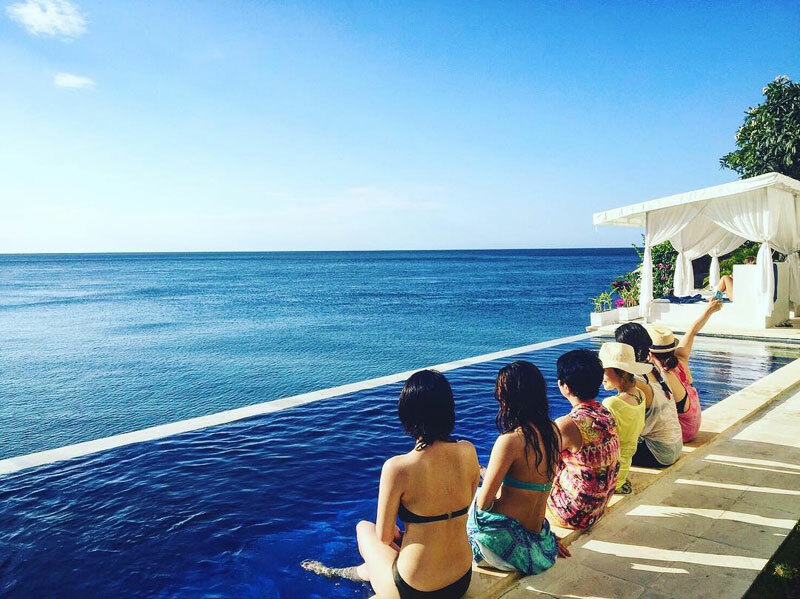 The loft-style housing, completely built from native materials such as limestones from the area, is a cute alternative from the usual type of architecture, and the infinity pool offers a sweeping view of the secluded Balangan beach. Yes, it’s Kuta, but not quite. This time, you get to have your cake and eat it too. Water sports advocates will find the hidden beach ideal for their adventurous endeavors, even while privacy is waiting right at their fingertips. 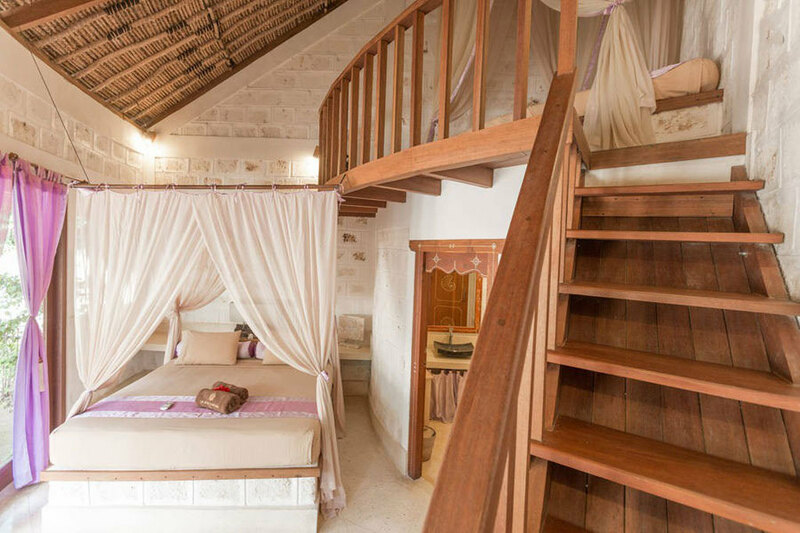 It may be pretty far removed from the rest of civilisation, but this loft is the place for a short weekend beach getaway – just remember to get back to reality when it’s over! 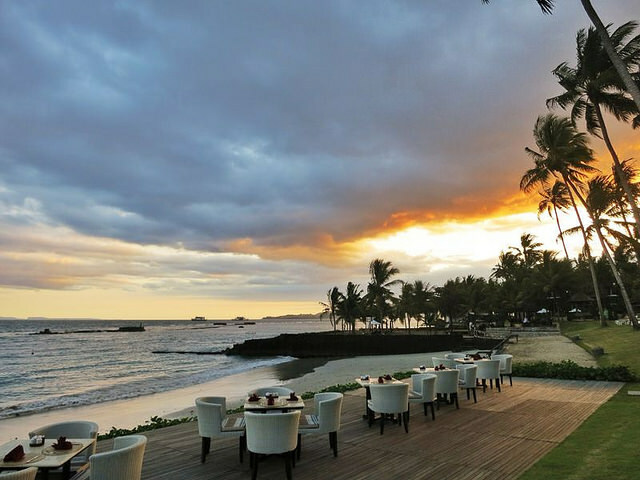 Far from the hustle and bustle of Kuta and Denpasar, Komune Resort & Beach Club is the picture of idyllic calm. 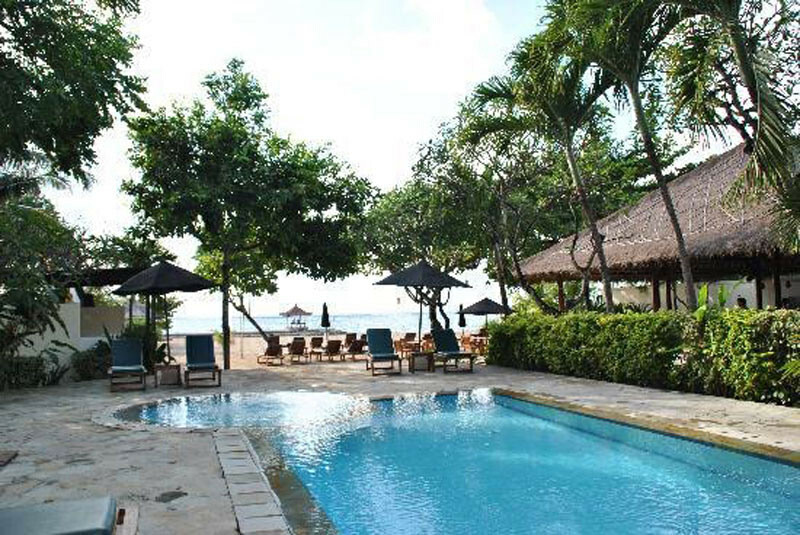 You can relax at the beach club and be entertained by the DJ, or picnic in the private gardens behind the hotel. To reach the beach, you just need to take a brisk walk through the tropical fruit tree gardens – so if you love nature, you’ll enjoy yourself every step of the way! At high tide, you can surf along the strong waves – very spectacular indeed! – and, at low tide, the sea becomes calm enough for weak swimmers to explore the rock pools and lagoons. 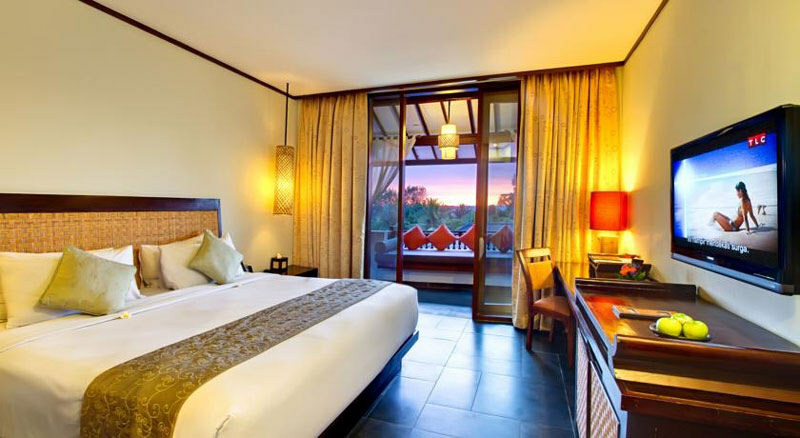 But if you just want to have a very restful holiday and not tax yourself out with activities, the resort also boasts of a private cinema, where you can watch screenings of surf competitions and newly-released films. 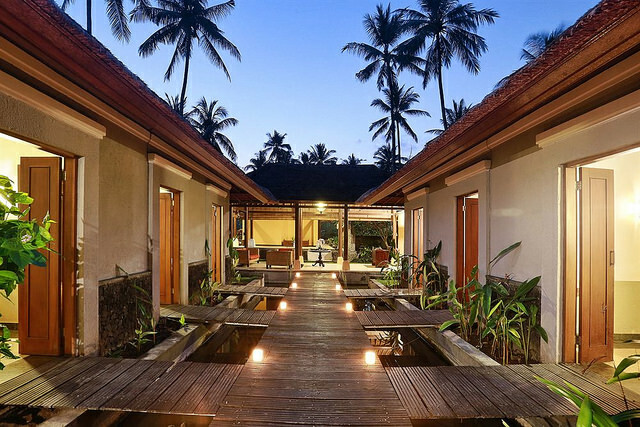 Nestled in a grove of coconut trees, the villas at Candi Beach Resort and Spa are built in a traditional Balinese style, from locally sourced materials. 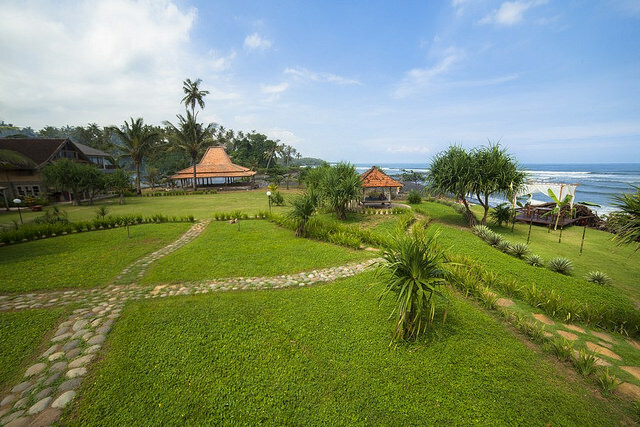 If you want another activity apart from snorkelling, you can hike to the Tenganan village. Tenganan is a Bali Aga village, where the people are of the pre-Majapahit culture, speak a unique dialect of Balinese and follow animist religion. You can also buy the beautiful ikat fabrics produced by the villagers themselves. 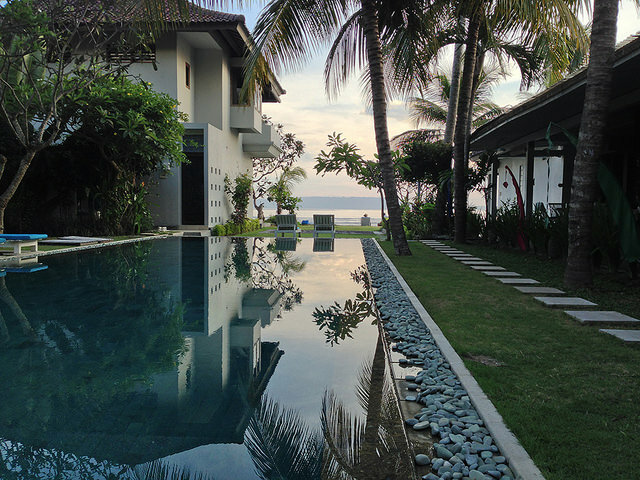 Do you have more amazing cheap beach hotels and villas to share about? Share with us in the comments section below! In between work and hockey games I travel. And of course I write for your delectation.